The Ryerson Students’ Union (RSU) vice-president operations is urging board members not to talk to media, according to an email to the membership obtained by The Eyeopener. On Feb. 9, vice-president operations Savreen Gosal wrote that some RSU members were contacted by The Eye about additional credit card statements. In the email she provided a statement from the RSU’s lawyer, also given to The Eye on Jan. 9. In the statement, the lawyer said the RSU corporate card was used by multiple individuals and while someone’s name may appear on a receipt, it does not mean that person made the purchase. “Any attempt to link a specific board member to a specific charge is unfounded and irresponsible,” the lawyer wrote, adding the RSU passed a motion to retain PricewaterhouseCoopers to conduct a forensic audit on the union’s finances. “The RSU is committed to being fully transparent with its members, but staff and board members cannot comment further while the investigation is underway,” the statement concluded. Gosal added if Board of Directors (BoD) members get media requests, they should forward them to her so she can discuss it with the RSU’s lawyers. She also asked BoD members who had already spoken to the media to contact the journalists they spoke to and tell them they no longer had permission to use their statement. 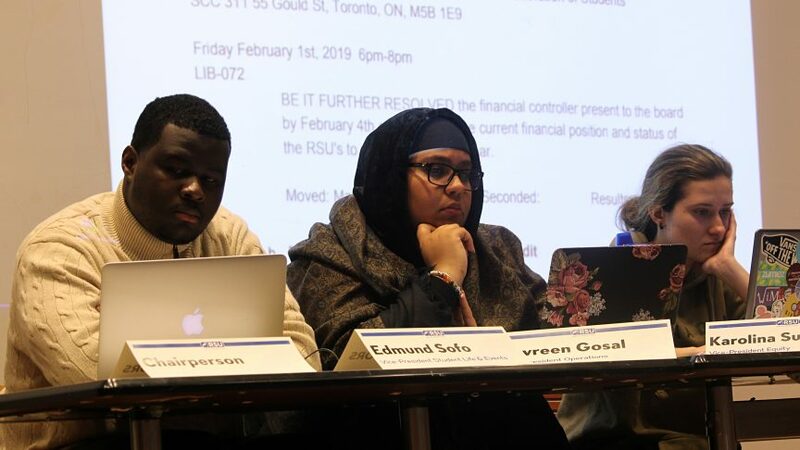 In an email response sent to Gosal, student groups director Maklane deWever said the, “damage to the RSU was not done by people raising legitimate concerns during board meetings…or to the media” but through, “a result of the lack of care and responsibility in managing our finances by the executive. He said a fiduciary obligation, “means [directors] have an obligation to act in good faith with regard to the interests of the students we were elected to represent.” DeWever said a failure to address the issues within the RSU would be a violation of this obligation. “I was not aware that we had retained a lawyer to be the official spokesperson of the RSU,” deWever added.